White winter walked in swiftly covering the trees with snow, the wild flowers bloom to welcome the season. Winter brings in refreshment and rejoices your life. It rings along the festive bells and celebration is in the air. The world takes on the playfulness waiting for the Christmas party, new year masquerade followed by the Valentine week. You can seize the opportunity of the upcoming holidays to send best wishes to your friends, love and relatives with fresh blossoming flowers, yummy pies and much more! Nowadays, doesn’t matter how far you are, you can always send flowers online to your loved one and express your care for them. You can select your favorite flowers classified for every occasion. You have to enter the address of the recipient and the well-planned delivery system of florists will take care of rest. 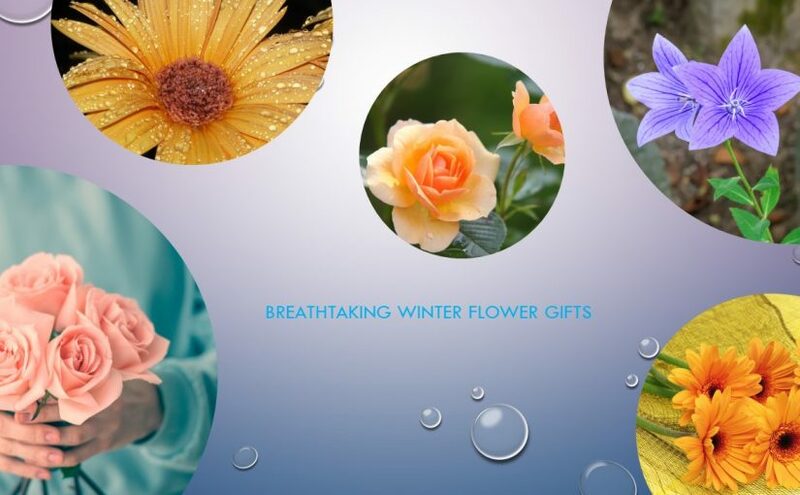 Herein we have brought you the most trending and colorful winter flower collection from the leading online stores, to help you give an exotic surprise to your special ones. The traditional rose bouquets and carnation baskets have become old-school. This winter you can explore something more vibrant that will soothe your heart. You can go for unusual combinations like red roses and Asiatic lilies, pink Roses with Peruvian lily or red roses with white carnation and white Asiatic lilies. You can add on a scented candle in between the bouquet to make it look more fascinating. The Bouquet creation is a work of art. Some space is always left in between the big flowers in the bouquet which can be gracefully covered by the smaller ones. The winter-special delightful multicolor pansy fits perfectly in the void and adds an enhanced fragrance to your special bouquet. The red, lavender or purple roses accompanied by white Pansy look pretty tempting. For the final touch-up, florists add wraps and glitter on the floral arrangement to make it the perfect gift. A flower bouquet cannot get any better than this; with the essence of chocolate, it becomes irresistible. The perfect gift for your lovely valentine. You can combine chocolates of your choice to make the combination a better one. On special occasions, some seller also add cute small teddy bears to your bouquet to make it even more special. White is the color for serenity and purity. It represents the innocence and faith of one heart to the other. The large white lilies arouse a sense of lavishness in winter parties. While you are sending flowers online, you can always use the add-on feature to add some lavender sticks or orchids to make your bouquet more appealing. Based on occasion you can get your bouquet customized and enhanced. Have a beautiful and colorful winter. Don’t forget to add a personally written message with the flowers. A personal message will enhance the smell of flowers and bring a smile on the face of your loved one upon getting the alluring flower bouquet!